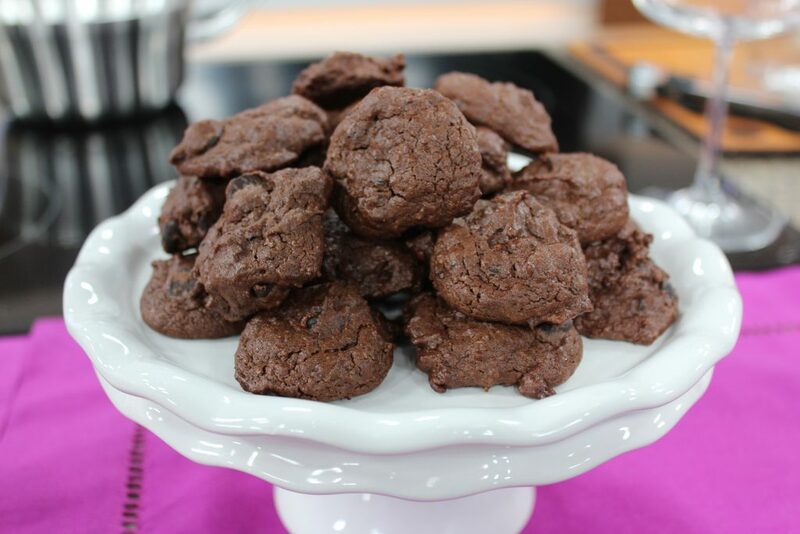 These triple chocolate brownie cookies are heart healthy and decadent – somebody pinch me. I’ve been trying to make a two-bite brownie ever since they appeared on the shelves several years ago. My regular brownie recipe just didn’t hold up in those teeny tiny muffin tins. After three creative attempts, I threw in the towel. I’ve always thought that combining cocoa powder, cocoa nibs, and chocolate chips was a really great idea, so when I started working on this recipe I had a stroke of genius – why not try for the two-bite brownie as a cookie? Even if they didn’t work, structure wise, I bet my Membership in the Society of Chocolate Lovers, that they would still taste great. And on my first try. So here, in my humble card-carrying chocoholic opinion is my next award winning cookie, with the heart healthy benefits of canola oil, natural cocoa powder, cocoa nibs, and dark chocolate. 1. Make sure that the rack in your oven is in the middle. 2. Preheat oven to 375°F (190°C). Line a cookie sheet with parchment paper. 3. In a medium mixing bowl beat together the oil, brown sugar, and honey. This is going to look like wet shiny sand, it’s supposed to. 4. Beat in the egg and the vanilla for about 3 minutes or until the mixture looks creamy. 5. Gently beat in cocoa powder. Warning: turn on those beaters full throttle and you will look like a cocoa mess in a couple of seconds. Gently beat the cocoa powder in on low and increase speed once it’s been incorporated. Then beat for 1 minute. 6. In a medium bowl stir together the whole wheat flour, wheat germ, baking soda, cocoa nibs, and chocolate chips or chunks with a whisk. Add to the cocoa batter. Blend until well incorporated, approx. 1 minute. The batter will be really sticky. 7. Drop by teaspoonfuls onto the prepared pan using a mini scoop. Bake for 8-10 minutes or until the outside is crunchy looking and they have puffed up. Don’t overbake these morsels; there aren’t a lot of things worse than burnt chocolate, okay I can name three but that’s for another day. My oven bakes these perfectly in exactly 9 minutes. 8. Remove from oven. Let cool for 5 minutes on the pan (they will deflate as they cool) and then remove from the cookie sheet and let completely cool on a wire rack. Store in an airtight container for up to 1 week or freeze for up to 3 months. Makes – 32 cookies using a 2 tsp (10 mL) mini scoop. When it comes to coconut oil I am waiting for long term research with big numbers before I make my decision. So right now I am not advocating it. If you are a person who chooses all organic there are several brands of organic canola oil on the market, all Canadian as well. Just wondering if there are many vegetarian recipes in Homegrown? You bet there are! We grow pulses in Canada so there are recipes using lentils, chickpeas, soy, edamame, beans and split peas.